Sweep through verdant hills, follow rocky coastlines and tip back a pint of Guinness. We have Connemara’s authentic landscapes, culture and music to ourselves. And if you’re a wee bit peckish? Fresh mussels, tender lamb, wild salmon and craft cheeses will sate your Irish appetite. 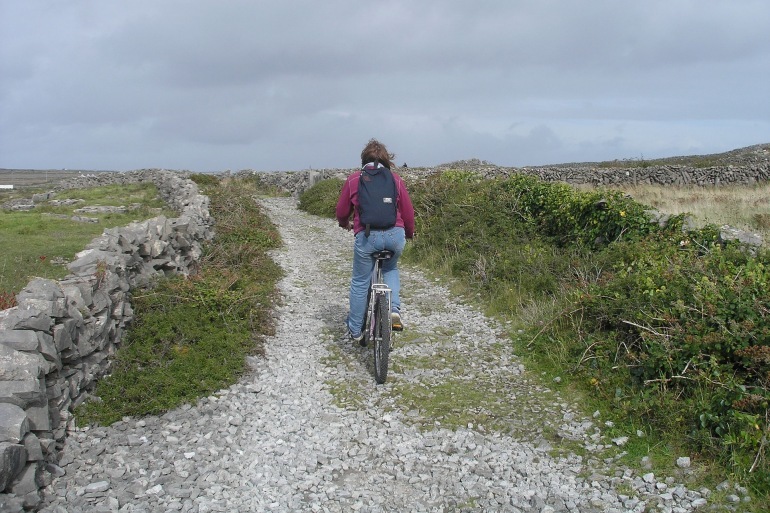 Ride through the spectacular limestone landscapes of the Burren National Park towards lunch at a legendary lobster bar. Tonight, we’re in for a treat with dinner at our hotel's award-winning restaurant. Enjoy a morning of coastal cycling along the breathtaking Wild Atlantic Way to the famous Cliffs of Moher. Tonight, we have a special medieval dinner planned in an intriguing historic location. Explore the sleepy village of Roundstone on foot, then pedal along the coast to Clifden. Dinner this evening is accompanied by traditional Irish folk music at a characterful fisherman’s pub. Catch the ferry to Inishbofin (keep your eyes out for dolphins!) and meet a local archaeologist for an informative walk around the island's rugged cliffs, Bronze and Iron Age ruins, and crumbling forts. After a typical Irish breakfast, cycle your way through Inagh Valley and to a shellfish farm on the shores of Killary. Stop for a tour of the farm and a picnic overlooking the harbour, then enjoy some free time back at the hotel (fly fishing or massage anyone?). After breakfast this morning, we’ll drive you just over an hour back to Galway in time for the Dublin train. A stunning 18th-century manor house in beautiful Ballyvaughan, Gregans Castle is warm Irish hospitality at its best. The property is surrounded by lovingly attended gardens and has spectacular views stretching across the Burren to Galway Bay. Its award-winning restaurant highlights amazing local produce, meat and seafood. Surrounded by 450 acres of beautiful wooded grounds overlooking its famous salmon fishery, Ballynahinch is one of Ireland’s finest luxury castle hotels. Its rooms are tastefully furnished in casual country elegance and its superb restaurant offers refined Irish classics using delicious local meats and produce. The terrain is generally rolling, with rare flat sections. That said, the climbs and descents are generally neither long nor steep. Daily distances average around 41 km (25.5 mi. ), with several challenging longer options available.